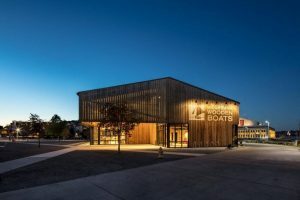 The Center for Wooden Boats (CWB) in Seattle, Washington, is expanding with its new Wagner Education Center. Designed by Tom Kundig, FAIA, RIBA, the new education center harkens back to historic Northwest boatbuilding facilities, while serving as a modern front door for the growing museum, Lake Union Park, and the surrounding South Lake Union neighborhood. The center’s design was inspired by the wooden boats housed within. It is a functional, straightforward building serving as an armature for the CWB’s activities. Designed for passive cooling—the building has no air conditioning—the occupants interact with it as they would a boat. Shape-shifting structures will be evident in the Wagner Education Center, where large windows will flank interior spaces, and movable exterior panels will shift up or down to allow for the control of natural light and open or close the building. The design features wood, glass, and steel, and just like on a boat, every inch of space and feature is designed to provide the highest function. The new building will house a dedicated youth classroom that can be converted to a sail loft in the evening, new gallery and exhibit space, and a boat shop designed to facilitate the restoration of the museum’s largest boats and the construction of new boats from historic designs. The education center is the largest part of a $9.5 million capital improvement project that is also upgrading the organization’s existing floating facilities at the south end of Lake Union. It will also bring necessary upgrades to CWB’s workshop and warehouse at the north end of the lake. The new CWB Wagner Education Center is seeking a Leadership in Energy and Environmental Design (LEED) Gold certification.